330ml bottle from Beer Hawk. Almost clear pale golden colour with a small white head. Aroma of pale malts and citrussy hops, grapefruit, floral. Taste is light sweet, citrus hops, floral, pale malts, finish is light bitter. Light-medium body, good mouthfeel and average carbonation. Excellent lager. Bottle from Beergium. Aroma is grainy malt and straw with grassy and fruity hoppy notes. Flavour is light sweet and moderate bitter. Body is light. 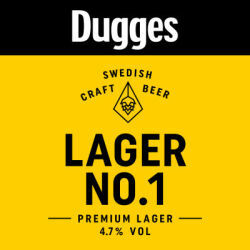 Likeable and above average Lager. Bottle from Cotteridge Wines; hazy golden yellow pour with a frothy off white head, aroma has sweet malts, taste has lagery malts hint of citrus, some floral and straw, OK.
330ml bottle @ Chez Sophie, Shrewsbury. Pours clear gold, nice white head. Aroma is lightly sweet malts, citrus. Taste is nicely balanced with pleasant sweet malts, light floral hints and just a touch of bitterness. Very moreish, should come in a 500ml bottle. 33 cl bottle from Systembolaget. Clear golden with a medium white head. Moderate malty aroma of bread and light caramel; moderate hoppy of citrus, florar and pine. Taste reflects the aroma. Medium bodied. Average carbonation. Low bitterness. DAAIK; Bottle 330 ML. Pours moderate, clear gold with a frothy, somewhat lasting and lacing, white head. Nose is moderate, malt, grain, hay, light yeast and spice. Taste is light sweet and bitter with a somewhat lasting, light peach, spice finish. Body is medium, texture is oily, carbonation is avarage. UPDATED: MAR 19, 2016 Backlog, early amateur rating! @ Havregatan 201209xx. Bottle from Systembolaget. Malty, sweet, grassy notes. bottle at gothenburg airport. poured a clear golden colour with a white head. nose is quite sweet malt forward. slight floral hop. Flavour of malt, breadcrumps, leading to a slight hoppy finish. nice bitter aftaste. quite tasty for the style!